It’s Saturday, Day 2 of Mixed Con. And despite all the fun I know I’m having right now, I couldn’t wait another week to share this burger with you. I mean, it is Sammich Saturday, after all! Do you ever have those days when you have a particular meal planned and then for one reason or another you don’t have one of the main components, so you have to just wing it? Well, that’s sort of what happened with these burgers. They were supposed to be green chile and bacon burgers, but alas, I didn’t have the green chiles I needed. So, I started scrounging around my produce drawer to see what I did have. I had avocado and I had green onions. Well, other things too, but nothing that sounded good for a burger. And so the burger building journey began, as I started completely from scratch. All the things that the other burger called for just didn’t work for what I wanted to do now. And let me just tell you that before these babies went on the grill (and after) they were the biggest, fattest patties I have ever seen in my life. Good lawd! Half-pound patties, at least! I couldn’t have been more pleased with how these turned out. They were so flavorful!! Big, juicy and full of flavor. Just the way a good burger should be! And having the bacon and green onions in the burger patty – amazing y’all. Pure bliss. All that flavor just swimming around in there, for every bite! Oh yeah…and the avocado on top! Maybe I should have called it the Avocado Green Onion Bacon Burger. Too much??? 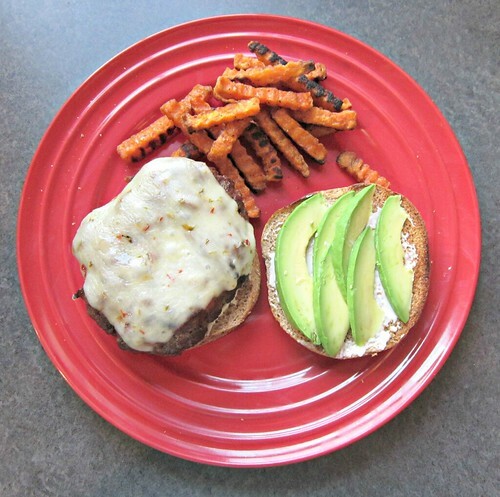 Whether you cook this on your grill outside (which I highly recommend) or on a grill pan in your kitchen, you don’t want to miss out on this amazing burger. Once the bacon is cooked and drained on a paper towel, combine the ground beef, green onions, bacon, seasonings and Worcestershire sauce together in a large bowl. Using your hands, mix until ingredients are evenly distributed. Form mixture into 4 large (or 6 smaller) patties. We did 4 large patties that were about 1-inch thick. Heat a grill or grill pan over medium-high heat. Once hot, add burgers and cook for about 5 minutes per side, or until your desired doneness is reached. We like ours with very little pink, so we cooked them a bit longer. Add the cheese during the last minute of cooking so it can melt. 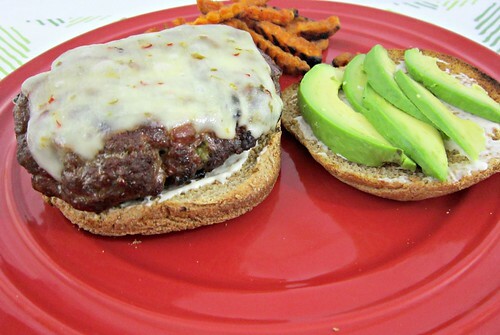 Toast your burger buns, apply mayo, mustard, or both to your buns, then top with a burger patty and avocado slices. Done and done, y’all.